Bible & Spade. Chap10: The Early Monarchy. BIBLE AND SPADE - BY STEPHEN L CAIGER D B - first published at the University Press, Oxford 1936. This Edition prepared for katapi by Paul Ingram 2003.
to the early years of Asa and Omri (c. 886). so that their archaeological remains are naturally more extensive than before. Yet the excavations have produced no very spectacular results? no inscriptions of an interest in the least comparable with the discoveries in Egypt, Mesopotamia, or even Hittite-land. Practically nothing remains today of the glory of Solomon or the Hebrew monarchs of that age save a few rough blocks of masonry and some pieces of broken earthenware. Yet it is wonderful how the modern archaeologist can piece such fragments together and read their story. It is impossible even to name all the sacred sites that have been excavated during the past century, especially since the formation of the Palestine Exploration Fund in 1865.
we must refer the reader to the many specializing books. and held in the cleft of the Kidron and Hinnom valleys. which now lies outside the modern city and can therefore be excavated. Here have been found traces of an original neolithic occupation going back to perhaps 3000 BC. and lending colour to the tradition in Josephus that the city was founded by the Hyksos refugees from Egypt. Arad-Hiba, and already the city was known as Uru-Salim. the city's name having been changed to Jebus. The Jebusite walls, and signs of the breach made by David's well-known assault upon the place, can still be seen. known by the name of its discoverer as WARREN'S SHAFT. 'I myself followed Joab's example when I explored the tunnel? they entered the tunnel that opens at the back of the cave. and runs for 23 feet by a branch passage impassible except at low water. at the side of which rose a vertical shaft about 50 feet high. until they were all landed safely in the little -chamber at the top of the shaft. which gradually rises by a gentle slope to a flight of steps at the end. Thus the archaeologist brings that exploit of three thousand years ago to life. On Ophel, too, David's 'tower that lieth out' has been identified, showing how his rough and hasty masonry had been repaired by Solomon's more carefully dressed stones. here, too, the marks of Solomon's strengthening masonry are clearly distinguishable. One of the curiosities of this tower was the discovery of faint traces of a painting of the goddess Ashtaroth, pathetic reminder, perhaps, of one of Solomon's wives. 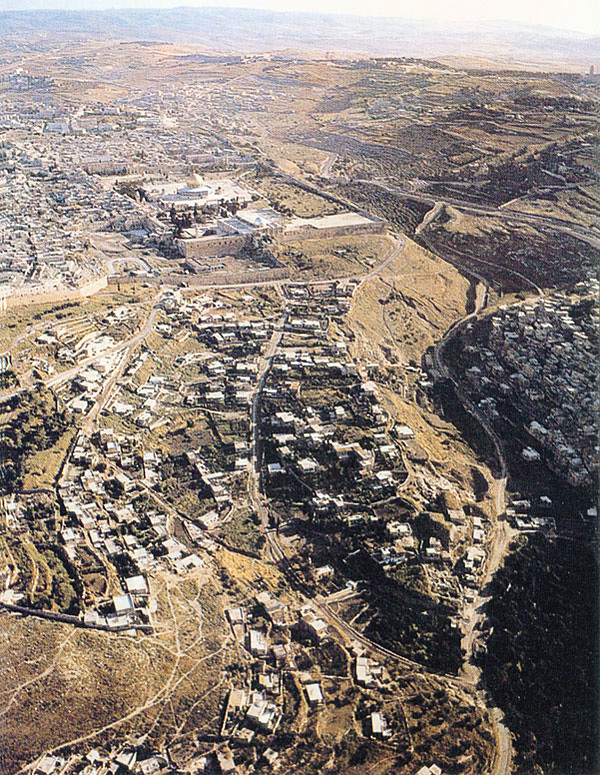 Of the royal palace and temple, however, no certain traces have been found, chiefly no doubt because they were situated on the upper right-hand square in our rough plan, that is on Mount Moriah, north of Ophel. The site is therefore within the modern city, and beneath the present 'Dome of the Rock'. 'So long as these sanctuaries remain under the guardianship of a suspicious people, hostile to research, so long will it be impossible to seek for any relics of the Solomonic buildings. But even if it were possible, it is improbable that much would be discovered. would show but scant courtesy to the work of his predecessors' (Macalister). All we can say is that the huge stone slab within the present Dome of the Rock most probably marks the spot where Solomon's altar stood. The channel that conveyed the blood of the sacrifices to an underground cavern beneath the altar is still visible. Perhaps we should add that none of the Old Testament sites in the modern city, such as the 'Tower of David' or the 'Tomb of Absalom', are authentic. but at Megiddo, one of the forts restored by him at the beginning of his reign (I Kg.ix.16). Here Guy found masonry of Phoenician type, 'executed by Hiram on his way home from building the Temple', the most interesting feature being a huge garage for chariots, and stables for a hundred horses. 'Between each horse was a stone pillar, to which, as holes drilled in them show, the halters were attached. Between each pillar there was a stone manger. More difficult still for the amateur to appreciate is the rapture with which the modern archaeologist gazes upon what he calls a 'potsherd'. to be covered by layer after layer of the dust of time. Then some archaeologist comes along and fixes the precise date of a site by merely checking off the pottery levels. Hence the supreme importance of the humble shard. In itself Hebrew pottery is exceptionally uninteresting. It has no beauty of colour, design, or workmanship, nor is it even original. It is identifiable, in fact, chiefly by its inferiority to other pottery of the same period and locality. 'is very easily recognized in the pre-Exilic period. It is a totally distinct type and inferior to the Canaanite in workmanship, though the forms are largely borrowed from them. The ware is lumpy, badly baked, and clumsy. but though the Hebrews imitated, they imitated badly. went down to the potter's house . . .
despite the fact that the two last at any rate were potentates of some international importance. so that historical records are practically non-existent. whether it was Pasebkhanet II (Knight), Siamon (Robinson), or Shishak (Breasted). Yet excavations at Gezer, which the Pharaoh gave as a present unto his daughter, Solomon's wife (I Kg.ix.16), show traces of Egyptian occupation and damage, together with subsequent Hebrew repairs. Macalister found that of the deities worshipped in the town, the most popular was Besh, the Egyptian god of dancing and revelry. Of the Queen of Sheba all we can say is that the excavations in Arabia have revealed an advanced civilization, named after her city 'Sabaean', probably the successor of the Minaean civilization described above [See pp.84 ff. ], and that the Assyrian inscriptions of a somewhat later age speak of the ruler of these Sabaeans as a queen. The Biblical statement that Solomon levied a tribute on the people that were left of the Hittites (II Chron.viii.7) and that later on a king of Israel was able to hire the Kings of the Hittites (II Kg.vii.6) will excite astonishment, until we remember that the great Hittite empire of the days of Thothmes, Tell el Amarna, and Rameses the Great was now a thing of the past. Their power had already passed its zenith when Rameses defeated them at Kadesh (1288), but 'the great disaster occurred about 1200 BC. From that date until a few years ago their ancient capital at Hattusas (Boghaz Keui) lay buried in forgotten ruins. But before their collapse the Hittites had founded the city of Carchemish on the Upper Euphrates, and here the 'people that were left of them' established another but a far less powerful kingdom, where, though much of the ancient Hittite art, writing, and culture was preserved along with the imperial name, the dominant racial note seems to have been Semitic. 'Thereafter, the "Hittites" appear in the records of Assyria and in the Bible, as a Syrian confederacy' (Garstang). Unfortunately the type of Hittite script they favoured most was not the cuneiform but the still undecipherable hieroglyphic, so that hardly any Neo-Hittite history is known to us. These were the 'Kings of the Hittites', their southernmost centre at Hamath, with whom the Hebrew monarchs had dealings. Quite possibly it is among the undeciphered inscriptions of Carchemish, Zenjirii, Sakjegeuzi, or Aleppo that alone we can look for the names of David and Solomon outside the Bible. Not till the reign of Solomon's successors, Rehoboam and Jeroboam, do we once more make contact with the inscriptions. has left a bas-relief on the wall of the Temple of Amon at Karnak showing him dealing the heavy blows of his victorious club on the heads of captive Jews. which, however, we must connect in all probability with I Kings 14 and the year 931 BC.